G-70-12 gondolas. This release will include Micro-Trains rock loads. Southern Pacific numbered these in the 160150-160449 series and George has chosen 160185, 160269 and 160407 for the road numbers. Please reserve these if interested. George Hollwedel has just contracted with Micro-Trains for another special run. This will be a Santa Fe TK-L tankcar two-pack. This is the same class car that Micro-Trains has done in the past but George is having them done in the repainted version. The Micro-Trains cars have been done in the 1930 "as delivered" paint. I will be doing a late 1940's scheme complete with color bands denoting water service. Micro-Trains has given George a May delivery date for the tankcars. Please book if interested. George Hollwedel has commissioned Micro-Trains to produce this 2-pack special run using MTL 50000 series, 34’ Wood Sheathed Caboose w/slanted Cupola and 51000 series 34’ Wood Sheathed Caboose w/Straight Cupola. 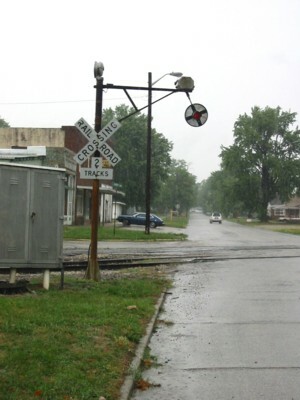 These cars are painted light boxcar red with black roof and white lettering and grab irons. The road numbers are 765 (MTL 50000 series) and 205 (51000 series). The price per 2-pack is $64.95. Grand Canyon - George Hollwedel commissioned Micro-Trains® to produce this special run 2 pack using the MTL 20000, 40’ Single Door, Standard Box Car. These cars are painted Santa Fe mineral brown with white printing and black and white Circle Cross Herald logo. 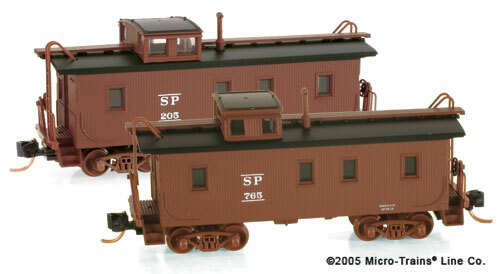 Two-hundred and fifty PS-1 box cars were delivered to the Santa Fe Railway in 1947. All 250 cars in this BX-52 class carried the “Grand Canyon Line” slogan. These are models of “as delivered” cars. The road numbers are 276524 and 276609. The cost is $49.95 per 2 pack. of "as delivered" cars. The "Super Chief" and "Grand Canyon" cars complete the set of four that were started with the "Chief" and "El Capitan" cars previously released. George Hollwedel commissioned Micro-Trains® to produce this special run using the MTL 20000, 40’ Single Door, Standard Box Car. El Capitan - Five hundred PS-1 boxcars were delivered to the Santa Fe in 1950. Four passenger train name slogans were placed on these BX-57 cars. The models are of "as delivered" cars. George Hollwedel commissioned Micro-Trains® to produce this special run using the MTL 20000, 40’ Single Door, Standard Box Car. Chief - Five hundred PS-1 boxcars were delivered to the Santa Fe in 1950. Four passenger train name slogans were placed on these BX-57 cars. The models are of "as delivered" cars. George Hollwedel commissioned Micro-Trains® to produce this special run using the MTL 20000, 40’ Single Door, Standard Box Car.